Τeltonika FMB964 is SPECIAL and smart GPS tracker with Bluetooth connectivity, internal high gain GNSS and GSM antennas and integrated high capacity backup battery. The device is designed to work longer without power supply. FMB964 with Li-ion battery can work up to 10 days in power saving mode. FMB964 is perfectly suitable for insurance telematics, delivery, trailers tracking, security & emergency services applications. Supported a wide range of power supply (6-30V) makes FMB964 suitable for motorbikes, light vehicles, trucks, buses. Don’t lose any records with microSD card up to 128 GB! Easy to install, hard to find! Prevent Your device from unauthorized disconnection using undetachable device cable and backup battery for detecting power disconnections. Dimensions only 79x43x12 mm. Τeltonika FMB964 is SPECIAL and smart tracker with Bluetooth connectivity, internal high gain GNSS and GSM antennas and integrated high capacity backup battery. The device is designed to work longer without power supply. FMB964 with Li-ion battery can work up to 10 days in power saving mode. 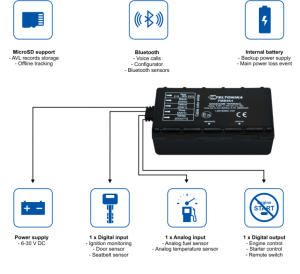 FMB964 is perfectly suitable for insurance telematics, delivery, trailers tracking, security & emergency services applications. Supported wide range of power supply (6-30V) makes FMB964 suitable for motorbikes, light vehicles, trucks, buses. Integrated Bluetooth® enables wireless headset and various other Bluetooth® devices connectivity. Make phone calls to your employee via Bluetooth® headset. No unauthorized calls anymore! Be sure that your employee is always safe and uses hands-free headset instead of phone! High capacity internal Li-ion battery ensures long autonomous working hours, receive tracking data and warnings when the main power source is disconnected. FMB964 features new case design which ensures increased protection against dust ingress and water splash from any direction. It is certified according IP54 protection class. FMB964 with IP54 case can be installed in machines with increased posibility of dust and water ingress.